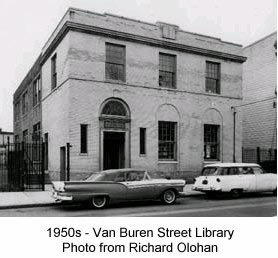 The Van Buren Street Branch Library was built in 1923. The building is cream brick in a modified Colonial style. It was erected at a cost of $44,628. The first floor houses an Adult Room, staff and work rooms. The entire second floor houses the Children's Room. Pictures, vases and decorative posters from the Art Department of the Main Libary adorn the rooms. Two museum cases, provided by the Newark Museum, include items from the museum. The collection of foreign books included books in Polish, German, Italian, Hugarian, Spanish, Lithuanian, & Russian.